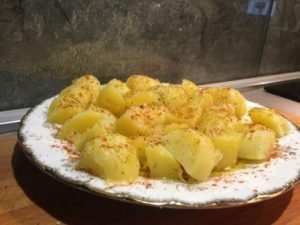 The secret of this potatoes recipe is that they are boiled, coated with spices and then lightly fried. I usually serve them as a side dish or you can make it your main meal if you add some crunchy bacon or pieces of sausages on top of it. 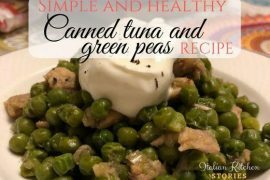 In the summer I serve it with fresh green salad and some prosciutto or fresh cheese and now in the winter, I would offer it as a side dish to a scaloppine chicken. 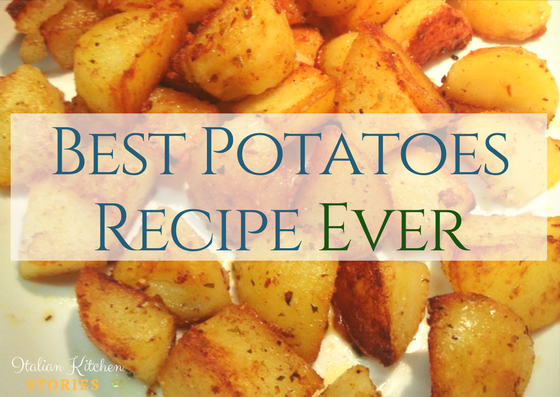 You need to follow a few easy steps and you will get these yummy potatoes ready for your table. 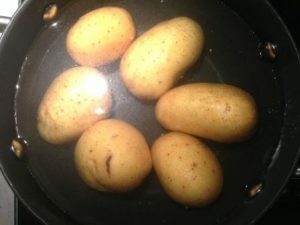 Boil your potatoes with the skin in salted water. If you have large potatoes you can pierce them a bit with your fork and in that way, they will cook faster. I keep the skin as that will prevent potatoes to overcook and to get too watery. Once they are cooked peel the skin and cut them into the cubes. I have cut each potato in half and then each half on 3 cubes. You can do the same or as you like. I prefer bigger chunks as they get easier to flip and they keep the shape better. Add salt, sweet red paprika, dry oregano, and olive oil. 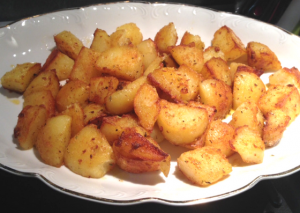 Mix it lightly without squishing the potatoes. 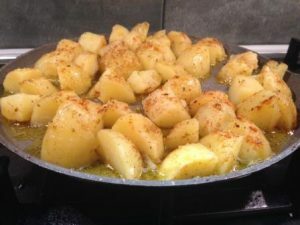 Heat up the non stick frying pan and add a tiny bit of oil (I have used olive oil) and add your potatoes slowly without mushing them. Fry potatoes on each side by carefully flipping them. They will keep the inside soft and will form a delicious crust all around. Serve warm and enjoy every bite.